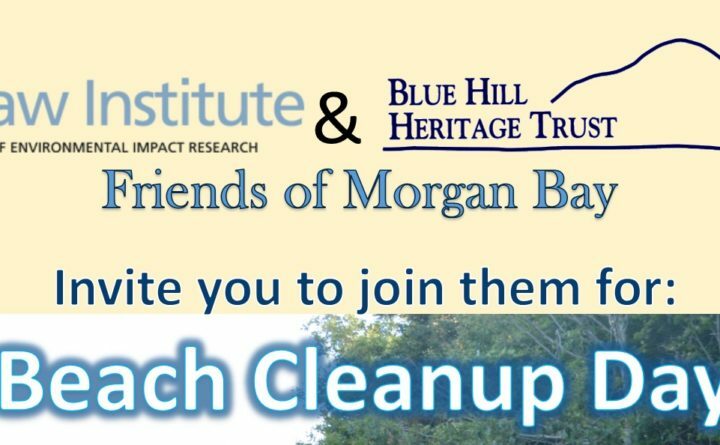 SURRY — The Shaw Institute and Blue Hill Heritage Trust invite you to join them Saturday, Sept. 15 for their 3rd Annual Beach Cleanup Day at Carter Nature Preserve on the Cross Road . Be a part of the Ocean Conservancy’s Global Trash Free Seas Day, and Maine Coastal Cleanup Day, by cleaning this beautiful property which is under conservation with BHHT. Carter Nature Preserve is a public wildlife sanctuary that offers several hiking trails and water access along its shoreline to Morgan Bay. Participants should arrive at the parking area closest to the bridge at 9 a.m.. We will assign volunteers specific areas and pass out necessary materials. We are looking for volunteers to work in groups to coordinate with data recorders from the Shaw Institute and BHHT . All data from the cleanup will be shared with the Ocean Conservancy’s International Coastal Clean Up Program. Participants will receive coupons for Pugnuts Ice Cream Shop and prizes will be awarded for the biggest, the smallest and weirdest finds. This is a family friendly event and there are several tide pools on the beach for younger participants to explore. We will provide garbage bags and have a water refill and first aid station. Please bring water bottles, wear durable work gloves, sunscreen and sturdy shoes. For further information or to sign up to participate, please contact Chrissy Allen at Blue Hill Heritage Trust (chrissy@bluehillheritagetrust.org; 374-5118) or Madelyn Woods (mwoods@shawinstitute.org; 374-2135) at The Shaw Institute.